Grunions Sports Bar & Grill is a South Bay local landmark. It’s been a local’s favorite spot to watch any major (and even minor) sporting event while eating the best pub food around. It all started in 1974 when Grunions Sports Bar & Grill opened its doors in Manhattan Beach, CA. 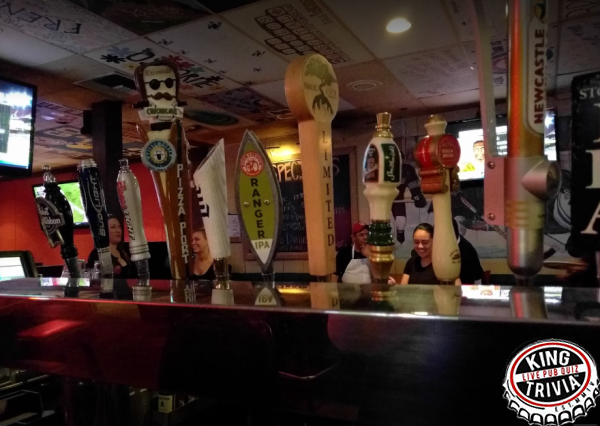 The mission then, as it is today, was to provide a place where people can go and enjoy great food and drinks while cheering on their favorite sports teams, in a comfortable (and family friendly) environment where everyone is treated like a regular even if it’s their first visit. Whether you live in the area or just visiting, we have what you are looking for…guaranteed! 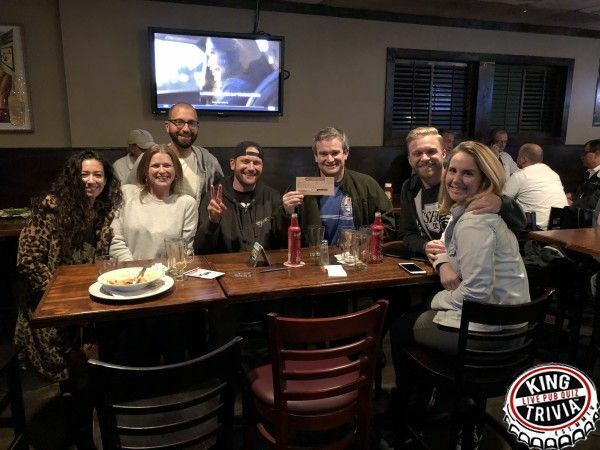 After a couple weeks off for the holidays, it was great to have trivia back at Grunions in the New Year! The usual 3 suspects took home the top prizes, but we also had many new teams this week.... Say My Name and Kat Gods were some of my faves and I hope to see your fun spirit back next week! Kudos to Quiztopher Walken for winning the drinking round by giving us Donald Trump's New Years Resolution: "To Lose Some Weight (Weight=68,000 Mexicans)." Honorable mention goes to "learn Spanish" and also "to speak in complete sentences". And one final, huge congrats to Diggle Bicks for landing in 1st place as their honorable Team Captain (and one of my favorite players!) takes off to San Francisco for a new job. You will be missed - and I hope your team continues to come to trivia despite your absence!!! 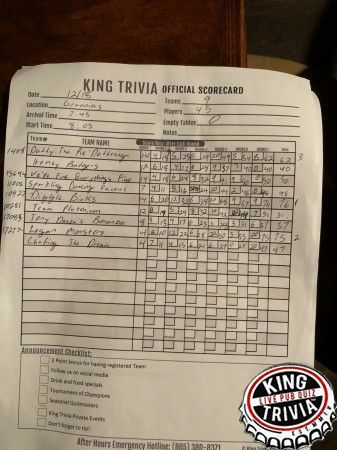 In what was one of the most remarkable comebacks I've ever seen in King trivia, the Logan Monsters mounted a steady rise to the top after a lackluster first few rounds. After a couple of double downs and a mid-round team registration for 2 extra points, they finished with an extremely respectable 75 points. Diggle Bicks (pictured, SFW) laid it all out on the table though and finished 1 point ahead after a dominant performance all night. With 62 points, Daddy the reDaddening rounded out the top 3. Congrats to Chafing the Dream who was at the back of the pack for nearly the entire game, yet pulled off an epic comeback win thanks to one key team member and a successful Double! They barely inched out Diggle Bicks, who landed just 1 point behind in second place! Kudos to Quiztopher Walken for another strong finish in 3rd place. And while Creed III tried their hardest to come out on top, their 2 UNsuccessful Double attempts is what truly costed them - but fortunately they DID win the drinking round! Thanks to Pencil Cases for stopping by, you were a small team yet held your own against the bigger teams.. Hope to have you back next week!